Are you searching for cheap Malaga airport transfers without compromising quality or maybe a luxury taxi with an adjusted price? The province of Malaga is characterised by its most important population centres being dispersed throughout and all along the Costa del Sol, and being the airport the main entrance point for the vast majority of the tourists that visit southern Spain, in some occasions a taxi can save us from a tiresome and tedious ride by bus, specially if we’re travelling with the family or with luggage. The public taxis are located just outside Malaga airport so they’re easy to spot, plus you don’t have to book one in advance. We have thought that it would be useful to provide information about websites providing taxi services in Malaga, so here below you’ll find approximated prices (taken from a recommended website). Shortcut: Jump to our recommended transfer website in Malaga. How much is a taxi in Malaga? Taxis will charge a supplement of 5.50€. The price per km is 0.59€ or 0.70€ depending on the fare. The minimum service from the airport is 15.21€ or 19.01€ depending on the fare. Prices for public taxis are for November 2018. What we consider a good transfer or taxi website? Those where you know what you will pay, no hidden surprises. Some of them allow payment on arrival while others you can pay online and have peace of mind about your transport in Malaga. Just by selecting one of the banners below you will be redirected to their secure booking online website. Easy steps for easy transfer! We have selected a website with high reputation and satisfaction grade for Malaga airport transfers, and of curse we are open to receive your comments. Contact us for doing so or use our transfers forum. Transfer service that offers a wide variety of vehicles for all pockets and preferences. Among its fleet, we highlight the offer in economic buses and taxis or luxury vehicles. Currently is the top one recommended because of the reviews and the confidence of the service. You'll get to your hotel fast and without queues. They check the arrival time of your flight, without waiting even if you arrive late. The form of payment is on arrival, so you do not have to make a payment in advance. 24-hour service and no waiting time. Prices are updated regularly on the website. Very positive reviews from their customers. Website in English, German, Spanish, Russian and Dutch. Transfers for you and your golf equipment. Taxis for your night out, so you can have a drink or two. They offer bilingual service in case Spanish is not your native language. *It is possible to add a seat for children under 12 years old or up to 3 years old under request. *Prices updated on March 2019. There is availability of buses with 26 and 54 seats and their corresponding luggage space. Great option for a transfer from the airport or any other place. Buses: They are especially useful if we travel with a group of people, with a lot of luggage. In addition we can rent them so that the driver takes us to some destination, like for example an excursion of a day to the Alhambra or going to Algeciras. The capacity is up to 54 people per bus and the price can be really cheap, there are also buses up to 26 passengers more economical. Minibuses: Just like buses, minibuses can be used for both transfers and excursions. The capacity of the minibuses can be up to 19 people in the larger version, or up to 13 passengers in the smaller version. If prices are shared in the end you will pay very little. Taxi transfers: Vehicles of up to 7 passengers ideal to transport us from the airport to our hotel or destination at a good price. There are options for all tastes, from economic transfers to top of the range cars, a taxi adapted to your budget. * Reference prices from malagatransfer.co.uk valid at the time of insertion (March. 2019). Private transfer companies offer on their website the option of hiring an authorized child car seat, which is mandatory under Spanish law. This provides extra safety for children during journeys. To book it you will only have to select it during the process, generally they have an extra cost of 5€ per trip. There are seats for children under 3 years old and up to 12 years old. Below are some other websites for buses and transfers from Malaga airport; buses are popular among groups who want to assist an event or make a tour. Friendly, reliable, multilingual company that you can trust at very competitive prices!. Pay on arrival your taxi transfer. You don´t have to spend time in Taxi Queues. Drivers are fully legal, licensed and insured. Pre-arrival quotes so you know exactly how much you will pay! 24 hr service from and to any location - every day of the year! All the vehicles are prestige air conditioned models for ultimate comfort. *Prices above are orientative and include a 10% discount for round-trip. Reputable shuttle company, high experienced multilingual drivers with all the insurance required for a safe journey. Flight number tracking so you would never have to wait, or worry when it´s delayed. Experienced drivers and all required insurance for a safe transfer from the Malaga airport to any other place. Pay on arrival service for pickup at the airport. Minivans and buses for Malaga airport transfers and tours in Andalucia. This service is popular among groups visiting Malaga for concerts and events from other provinces. 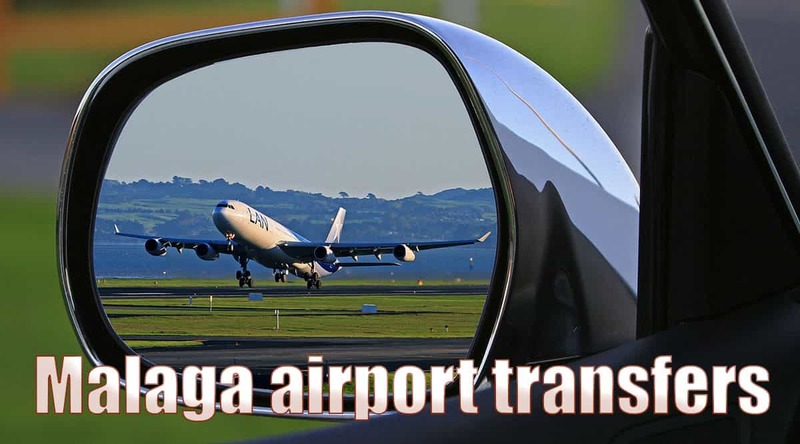 Get from Malaga airport to any other place using their bus transfer services. Attractive bus & minibus prices from Malaga airport. Excursions by bus: Possibility to design your own excursions. Ask for a budget and create your personalized excursion. Weekend bus trips: If you don´t want take the car over the weekend and have a great time with your friends do not worry about driving and rent one of our minibuses with drivers, we take you wherever you want. Stag and hen parties: Picking up of fiancée and friends, transfers to a restaurant, club or pub and return to the starting point at the agreed time. Weddings bus: Pick up of the guests in the church, transfer to the restaurant and return at the agreed time. Special offers if you hire stag and hen nights and wedding..
Sports clubs bus: Transport for Sports Clubs. Minibuses or buses with large capacity available for your convenience. Comfortable and reliable service sing minibus services with malagabus.com. Offering transfer service for all Andalucia with fully licensed and english speaking drivers,full insurance included for a safe journey. One of the best prices for transfers at the Malaga airport. English and spanish speaking drivers fully licensed. Wedding and private transfers in Malaga. Going Out, Golfing, Stag Do, Parties, etc. Secure online payment, pay and have peace of mind about transport. *Prices in the example above include a 10% discount for round trip. Drivers are multilingual and friendly, fully licensed and waiting for you as you come off your flight even when it is delayed. Staff will accommodate you with pre-booked quotes and conditions. Variety of services, including weddings, stag and hen do`s, chauffer, day trips...you ask for it. Pay 50% in advance and the rest on arrival. It is the first website offering this option. What we expect when booking a transfer online is no delay neither queues and of curse a friendly driver who talk our own language, everything must be perfect for our holidays. Who want to spend their time just after arriving to the airport waiting a delayed transfer or trying to explain to an unexperienced driver something when he is not understanding correctly our language?. In a wedding, going out, or any other circunstance we would need a transfer, we expect the service to be what it should be. Some of the websites above let you pay on arrival while others will ask you for online payment. It depends on you, if you want to pay and have peace of mind or prefer to pay on arrival to the driver. We hope to be of help for your holidays; please feel free to let us know your experiences from Malaga airport transfers using our forum.